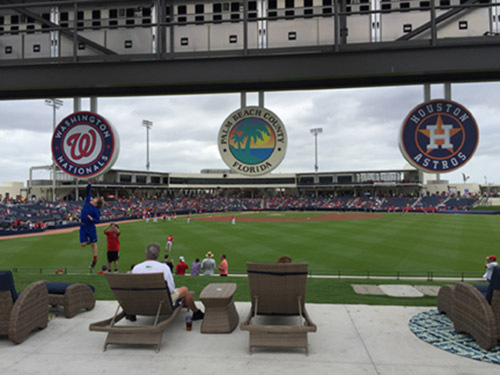 We have a new name for The Ballpark of the Palm Beaches, spring home of the Washington Nationals and Houston Astros, after a naming rights sale: FITTEAM Ballpark of the Palm Beaches. The Nationals and Astros paid about one-third of the initial $135 million cost of the facility, as well as construction overages, which people familiar with the situation estimated at about $15 million last spring. Exactly how much they will receive from the naming rights deal annually remains unclear, though the Detroit Tigers sold their facility’s naming rights to Publix for a deal worth $3 million over 15 years, according to reports. The New York Mets recently agreed to a 10-year deal to rename their spring training home First Data Field, though the financial terms of that deal have not been disclosed, either. “We are excited to be partnering with a local brand that shares our commitment to the West Palm Beach community,” Alan H. Gottlieb, the Nationals’ chief operating officer, said in a statement.